This is based on a recipe which goes back decades in TheHusband’s family. Well, it’s based on two recipes. The family’s recipe was originally from the New York Times but the clipping was lost long ago. It’s a bit unusual in that it features green peppercorns, but we all like it a lot and it’s become a staple in the winter months. With the advent of the NYT’s online archive, I decided to try and find the original recipe (I’d found my 1982 Stilton and Cheddar recipe, so why not?). I eventually found it but I couldn’t believe it was the right one, because it was so different. I could see the bones of the original recipe in my mother-in-law’s version, but there were more differences than similarities in the spicing. What follows is a hybrid of the two. Heat oil in a medium-sized dutch oven. Add garlic, jalapeños, onion, and pepper and saute for 7-10 minutes on low heat. Add bay leaf, basil, and oregano and cook for 2-3 minutes, then add tomatoes and cook for another 2-3 minutes. Add white wine and boil until it is reduced by half. Add broth, water, peppercorns, and salt. Cover and simmer for 25-40 minutes (longer is better but the tomatoes should break down in about 25 minutes). 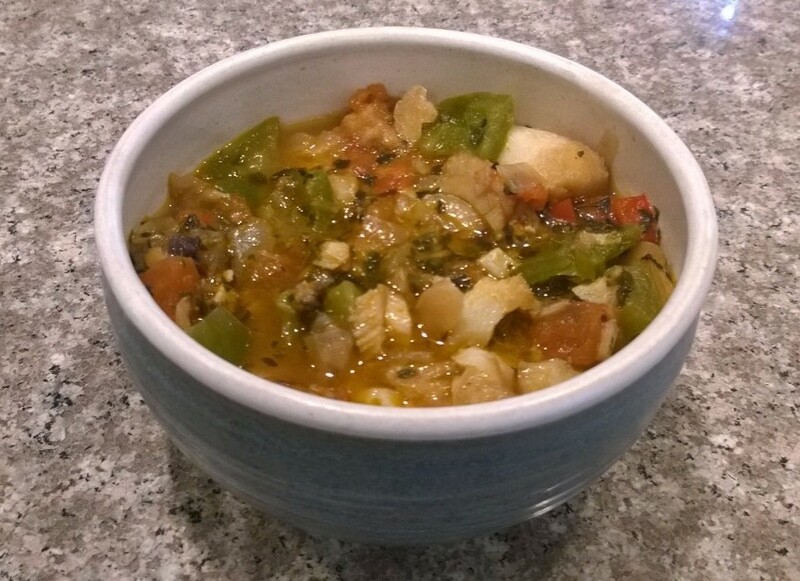 Cut the cod into 2-inch chunks and add it to the soup along with the olives and capers. Return to a simmer and cook, covered, for about 10 minutes. Remove lid, add butter, and cook at a brisk simmer for another 10 minutes or until soup is slightly reduced. Halve or quarter the potatoes, place in a soup bowl, and pour the soup over them. Or you can omit potatoes and serve with crackers or fresh bread. NOTE: If you don’t want to invest in an entire jar of green peppercorns, you can use black, mixed (the white/red/black ones) or even Szechuan peppercorns. If you substitute, cut back the amount to 2 teaspoons. It’s a sign! Just last month I picked up a little jar of green peppercorns at the supermarket, just because they cost only 21p and looked interesting.I have been wondering what to do with them 🙂 I shall try this. It sounds really different… olives and capers in a soup? Cool! Now that is definitely a sign! I hope you enjoy it. It does sound a bit odd, but it all comes together.